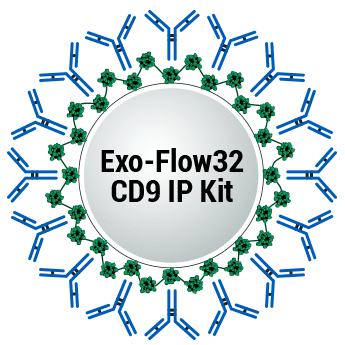 With magnetic beads already pre-coupled to anti-CD9 antibodies and delivered in a 32-well format, SBI’s Exo-Flow32 CD9 IP Kit simplifies high-throughput, antibody-based exosome isolation. Our magnetic bead-coupled anti-CD9 antibodies are extensively validated, and the high-quality Exo-Flow IP kit components ensure reliable, reproducible affinity-based exosome purification directly from serum or plasma. Exosomes can also be purified from other biofluids such as media, urine, and CSF, but must first be concentrated using either ExoQuick-TC® or ultracentrifugation. Even better, with our larger-than-typical bead size (9.1 μm diameter) exosome capture is highly efficient, enabling capture of billions of exosomes from one sample. To facilitate a range of studies, SBI built the Exo-Flow IP system to be highly modular. We offer a range of magnetic bead-coupled antibodies in 32- and 96-well formats. For these studies, either human serum or HEK293 exosomes concentrated from cell culture media using ExoQuick-TC were added to the antibody-coupled magnetic beads. After washing, exosomes were eluted and recovery estimated using a standard BCA protein assay. Figure 1. CD63 and CD9, two exosome markers, are readily detected in samples purified using Exo-Flow Kits. Approximately 1 µg of protein was loaded per well on a 4-20% gradient protein PAGE. The proteins were separated and transferred to nitrocellulose membranes for Western blot analysis. The blots were probed with either with anti-CD63 or anti-CD9 antibodies to detect the exosome protein markers. Figure 2. NanoSight analysis shows Exo-Flow IP Kits deliver good yields of particles whose sizes are consistent with exosomes.